NICK Riewoldt admits he might be facing a losing battle on the home front. No thanks to his cousin, Richmond spearhead Jack Riewoldt. "I've got a fight on my hands with my eldest son, James. He's almost four," Nick explains. "Jack comes around for dinner almost once a week and he's trying to brainwash him into becoming a Tigers fan." Richmond are the hottest team in the competition - the reigning premiers and strongly favoured to go back to back. The Tiger Army comprises 100,000 members, a record for an Australian sporting franchise. Young James, of course, has red, white and black blood running through his veins courtesy of his dad, a St Kilda legend. But the Saints are failing to make a suitable case for the young fella to get behind them at the moment. They finished 16th on the ladder with just four wins and a draw in season 2018 - their first since Riewoldt's retirement. "I'm an ex player but I'm also a supporter ... I haven't enjoyed seeing them struggle this year," Riewoldt said. "Sitting on the other side, you feel for the supporters a lot more. You're exposed a lot more to commentary surrounding it, the frustrations of fans. Riewoldt hung up the boots with 336 games and 718 goals to his credit. There were also six best-and-fairest awards and five All-Australian jumpers. He was the consummate professional, living and breathing AFL to become a champion. 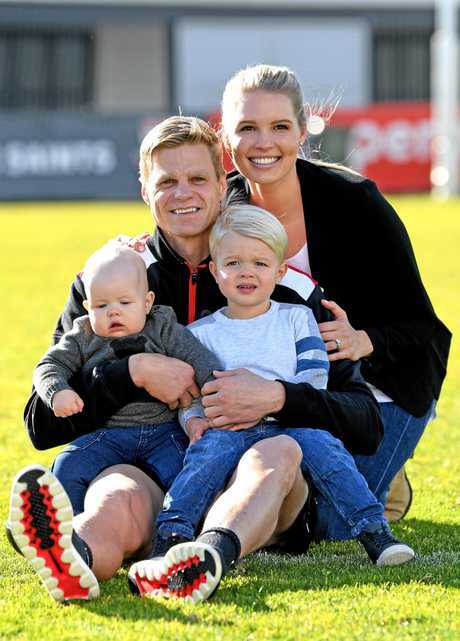 While commentating for Fox Footy post-playing career, his focus now is very much on family - wife Catherine, and sons James and William, almost two. "The major difference is I don't take it (work) home with me like I did (when I was) playing," he said. "Playing was a lifestyle; sleep, diet, it was all part of it. "I can leave the ground, or leave the studio, and how I sleep and what I eat, it's a lot more relaxed. "When I'm at home, I'm at home, my mind's not elsewhere. I'm a lot more present with my family, which is great. "I miss being out there and playing but I don't miss the build-up at all. "The build-up had me in knots ... every game for 17 years." Wife Catherine was also relieved it had come to an end, having spoken publicly about the fear she experienced surrounding the concussions her husband suffered late in his career. Riewoldt is now an integral member of the Fox Footy "team", and very much content. There's still the occasional itchy feet such as calling a Collingwood v Richmond clash at the MCG earlier in the season. The teams will do battle again in tonight's preliminary final. "We did the pre-game and half-time and all from ground level, had a platform set up. Huge game, huge crowd," he said. "That was the first time I thought 'ah, I'd love to be in the rooms right now, getting ready to run out'. "And finals, naturally, that's when we all get pretty excited as ex-players. You can feel that amongst the commentary team. "The whole industry has a spring in their step. "But, that transition (into retirement) hasn't been as hard as I thought it was going to be. "When my own team has struggled that feeling of missing out hasn't been as bad as I thought to was going to be. "It would be different if the Saints were still playing at this time of the year." Riewoldt was the Rising Star winner in 2002. His star is now very much on the rise as a media performer. "It's not something I set my sights on 10 years ago and really wanted to nail when I finished playing footy," he says. "It's evolved organically as I've been exposed to a lot of media throughout my career as a player, particularly as a captain. "I was pretty proactive in doing some extra stuff, with a lot of different providers. "It's been great to still be able to scratch the footy itch, and stay involved with some of the great people that I've met." 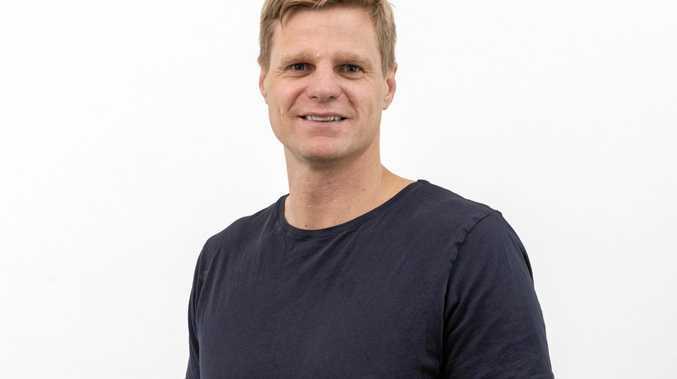 Such is his footy 'IQ', Riewoldt could easily walk into a coaching job, but he said "I've got no interest at the moment". "Bucks (Collingwood coach Nathan Buckley) did a bit of media to start, then transitioned. (Geelong premiership skipper) Tom Harley did four or five years and then got back involved at club level (with Sydney). "I'll never say never because plenty of others have gone down that path, but at the moment I just don't have that passion, which is what I think you need." Riewoldt has come a long way from being the blonde-headed beanpole from Queensland few had even heard of when drafted in 2000. He was born in Hobart but grew up on the Gold Coast. He had been studying at Griffith University when the Saints, then coached by Malcolm Blight, selected him as the top pick. 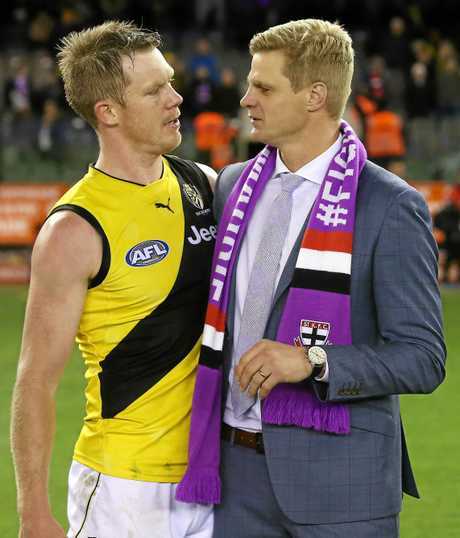 "Not many people knew I potentially had a career ahead of me in footy," Riewoldt said. "I left one weekend, came down (to Melbourne) for the draft. 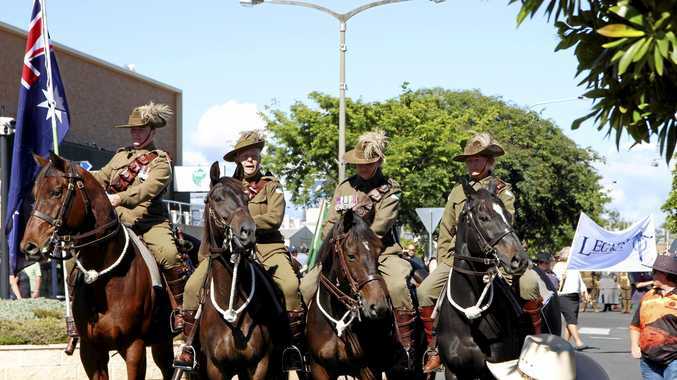 For a Queenslander to go No.1, that has never happened." Riewoldt injured his knee during his first pre-season and missed the majority of his first campaign. But it wasn't long before he was making a huge impact as a mobile centre half forward, who would end taking more marks (2944) than any other player in the history of the AFL/VFL. The Gold Coast Suns would come calling in 2009 when the club was being set up, hoping to prize Riewoldt out of St Kilda as a marquee player. "There was a little bit of contact there but it didn't progress very far, never got very far at all," he said. While his family and friends have moved away from the area, Riewoldt still has a soft spot for the Gold Coast, and sympathy for the floundering Suns. "I lived there for a long time, saw a lot of rugby league teams come and go, soccer teams come and go, basketball franchises come and go," he said. "I hope for their sake they are able to make it work. But it's a bloody tough market. "You need on-field success, you need to find a way to captivate the audience. "(Chief executive) Mark Evans is a great operator, (head coach) Stuart Dew is really highly regarded. Hopefully with those key pillars in place they are able to turn it around." Riewoldt had been neck deep in trying to lead the Saints to a drought-breaking flag when the Suns were forming. St Kilda, circa 2009-2010, were as strong as any team that has been denied the cup. They lost to Geelong in the 2009 premiership decider by a couple of goals. They then drew the 2010 grand final against Collingwood before losing the replay. "I think about it a lot," he said of those narrow misses. "But that's the reality, we just came up against some really good sides during that era. "Those grand finals in 2009 and 2010 could have gone either way. "It doesn't make it any easier but the only way you can reconcile is to know that you did everything you possibly could throughout that period and just came up short." Riewoldt now has to look on as cousin Jack shoots for a second premiership medallion in two years. All the while hoping James isn't won over for good. 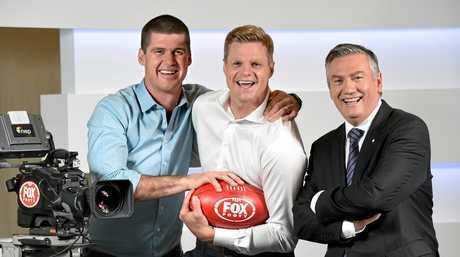 Watch Nick Riewoldt on game days and AFL 360 during AFL finals this September on FOX FOOTY. FOX FOOTY has every qualifying, elimination, semi and preliminary final LIVE in HD with no ad-breaks during play (channel 504 on Foxtel).